RADIX 31 is a broad spectrum antiscalant, especially designed to inhibit deposition of inorganic scales in multiple applications areas, particularly in RO membrane systems. It is efficiently utilized in inhibition of multiple inorganic scale species including calcium sulfate, calcium phosphate, calcium fluoride, barium sulfate, strontium sulfate and silica. It stabilizes metal ions to prevent metal oxides precipitation and disperses existing metal oxides/ hydroxides, silt and clay particles. 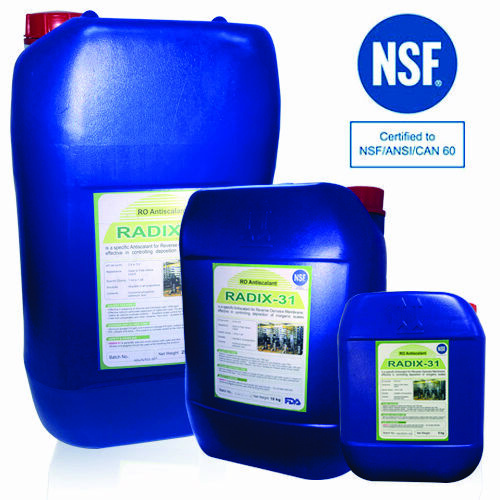 RADIX 31 is an NSF Certified, Food Grade RO Antiscalant. It is an environmentally friendly antiscalant, particularly applied at surfaces where discharge of waste into the environment is a concern.